Manager: This Is The End Of The Line. This channel is a compilation of videos, photos, and articles surrounding the protests against the Northern Gateway Pipeline. The Northern Gateway Pipeline is a proposal by Enbridge to construct two 1,170 km long pipelines between Bruderheim, Alberts and Kitimat, B.C. The pipeline would cross more than 800 streams and rivers, including sensitive salmon spawning areas near the upper Fraser, Skeena, and Kitimat watersheds. As well, it would cross through more than 50 First Nations communties. This pipeline would bring more than 225 oil tankers to British Colombia's beautiful North Coast for the first time ever. The proposal has spurred opposition in communities all over Canada. 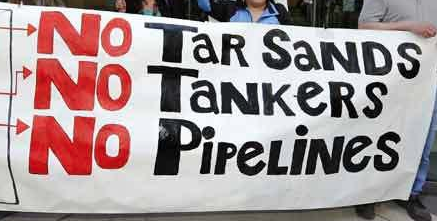 From First Nations groups to environmentalists, citizens are joining the movement against the construction of the Northern Gateway Pipeline.